Computer Institute is committed to customer satisfaction. In the past 34 years , we have created a very friendly learning environment with the latest computer hardware and software technologies. 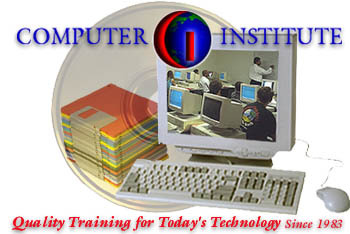 Thousands of corporations have sent their employees to Computer Institute for customized and individual training using our state-of-the-art training facilities. Instructor-led classes are available for many courses. For those applicants who want to learn about computer hardware/repair and software and become a Certified IT Technician, A+ Certification offered every month. For those who want to start to learn the networking technologies, Network+ Certification is offered every month. If you need security certification, we have several schedule for Security+ Certfication by CompTIA. If you want to become a Microsoft Certified Associate (MCSA), or Microsoft Certified Expert/ Engineer (MCSE) we have the right courses for you. We have also designed the most optimized workshop for Cisco Certifications by the experts in the field where you configure and learn about routers in a hands-on computer lab, and earn certifications in CCNA and CCNP. We have designed the most comprehensive certification for Oracle Certified Developer/Adminstrator Associate (OCA) where you take courses in both developing and administation of databases. If you wish to become a Web Designer we can help you to succeed. You can combine many of these programs to get double or triple certifications. We have articulation agreements with Strayer University and other local colleges, you can receive college credits from these institutions. Transferability of these credits lies with the accepting colleges and universities. Well-qualified, experienced certified instructors train the participants with easy-to-use step by step training material in the most optimized period of time. We provide life time free telephone support to our clients. We are so sure about the quality of our services that we say: If you register for A+, Network+, Security+, CNA, MCSE, MCSD, CCNA, CCNP or Oracle Certification and fail a test, you can retake the course for the test that you failed free of charge. The course must be retaken within a month of the completion date of the course, subject to availability of course & seat and other limitations. Most of our training programs are offered in two different formats, instructor-led classroom or online training over the Internet.